Handmade Red and Green Wool Christmas Ornaments (Set of 4), "Red Jingle Bells"
Red jingle bells announce the much awaited arrival of the holiday season in this colorful set of four Christmas bells designed by Rajesh Gehlot. Each bell is crafted in red wool felt and enhanced with white glass beads. 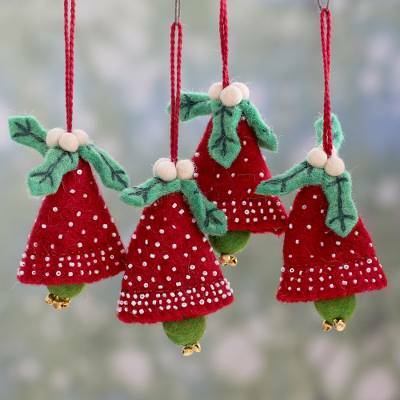 Featuring green clappers, each ornament has a tiny brass bell and a cotton string for hanging. Nicely made, bigger than I expected, about 3 to 4 inches tall. I love hanging these ornaments so they show off as a pretty little grouping.